A colourful, kinetic tale about an artisan sausage seller and his baked goods companion stall holder may not be where you’d expect to find scathing discourse on consumerism and personal integrity, but for the multi-award winning short Sausage, Robert Grieves mixed his passion for food ethics with a desire to make an entertaining film first and foremost, and wound up with a fun short that plays across multiple levels. We sat down with Grieves to find out how Sausage enabled him to expand his filmmaking horizons and just how many of his own babies he had to kill to bring the project to screen. As well as filmmaking you teach animation at Camberwell College of Arts, are there core concepts which you try to impart as a foundation for your students? Indeed I do, in particular I promote the principle of ‘animating with attitude’. When running animation courses for Illustration students at Camberwell, I ask them to inject the attitude of their illustration work into the way they animate. 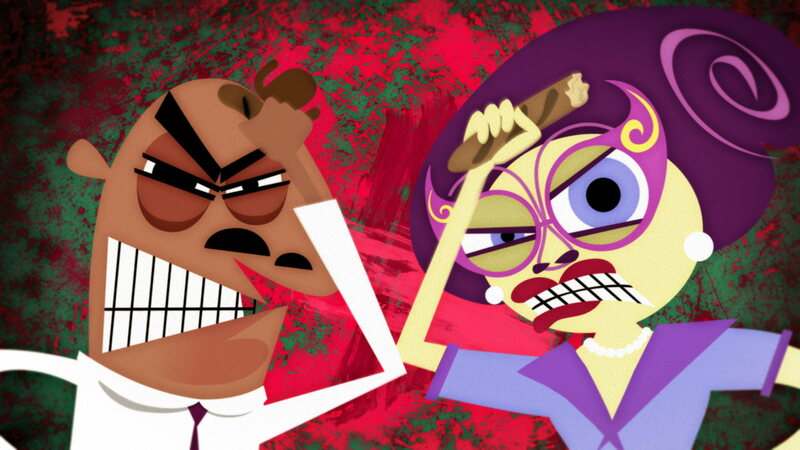 Too often in the industry, illustrators have their work brought to life by other commercial animators in a generic manner, with bland and disjointed results. As illustrators animating their own work, they have the opportunity to inject the movement with many of the same qualities they’ve developed in their artwork, with results that might not be as polished, but are far more genuine. Sausage’s narrative echoes your creative drive to make a self-funded solo project. What was the inspirational spark that set you on the path to create the film? I turned 30, looked at my work, and though “how bloody mainstream”. Plenty of impressive clients etc., but my showreel didn’t have enough heart and chutzpah. So I started a film as a platform to build a visual language that was more my own, as well as to have a chance to develop the skills to work with narrative films, namely story telling and character animation. I also hoped that the results might strengthen my profile as a director, a “Calling Card” as they say. How did the script develop to include commentary on areas such as food ethics and personal integrity alongside the kinetic fun which moves it along? Well the film’s setting of a market square came first, then the 3 character combo of an innocent hero, sassy heroin and alpha bully. The punch line (which I won’t give away) is food based, so the plot was always going to feature food, but my connection with food started with collecting 50s cook books at Uni, after which I became a Chef for a few years. I think what happens with writing is that your own ethics just creep in, because that’s your default perspective on life, and that must especially apply to new writers like myself. I never intended to make a ‘message film’, but Sausage did end up with social commentary, and as I’m passionate about ‘shopping local’ it feels like the inevitable channelling of my own ethics. I did however intend to make an ‘entertaining film’, and it’s more important to me that that Sausage succeeds on that level first. I think what happens with writing is that your own ethics just creep in, because that’s your default perspective on life. You have a solid working background as a motion designer, how did creating Sausage differ from the client based work you normally do? The big difference was that I was the client for my own film. The brief, feedback, deadline, all my own. I regularly sought advice and opinions, but I got to pick and chose which of that I listened to. I’m tempted to say “that qualifies this as ART over DESIGN”, but that word scares me so I wont say that. Many people told me I needed a deadline, but I knew the end would come when I was happy with it, and that was a pure gut feeling. It’s costly to animate material that ends on the cutting room floor, yet you dropped a scene of the two heroes as children, why was that? There’s a bizarre industry phrase “killing your babies” – it’s used to describe the moment a creative has to sacrifice their own creations, particularly ones they’re attached to. The industry hardens you to slaying some of your best work, which is fortunate for me, cos the production of this film was a ‘baby massacre’. While making Sausage I killed over 3 minutes of character animation, to the point where I’d even forgotten the whole section you mention in your question. That degree of waste is not usual, and not good, but it was necessary for me as a newcomer to narrative filmmaking. Had I known more at the start my storyboard would have been tighter and based on a better developed plot. But as I made this film to learn those very storytelling skills, all I can do is wipe the baby blood off my hands and move on. The industry hardens you to slaying some of your best work, which is fortunate for me, cos the production of this film was a ‘baby massacre’. Dan Radclyffe’s playful score really propels us through the film’s action. What was your working process with Dan? THE most dynamic and enjoyable part of this film was the 3 days I spent in the recording studio with Dan Radclyffe (Aka UTTERS). The rest of the filmmaking process was long and hard, where as making the soundtrack with Dan was just euphoric. To be clear, Dan did all the work – composing, playing, singing and producing. Watching that come together was an epic experience for me, but the reason I was in the studio was to guide Dan through the film’s emotional dynamics, which only a director can do. Most composers wouldn’t be comfortable having the director there throughout, but Dan was super cool with it, and now I can’t imagine how else it could work. The film was 100% complete when Dan started, and I’d been looking for the right composer for ages, with a mix of results. I learnt the importance of finding that right person, and then enjoy the magic as it happens. 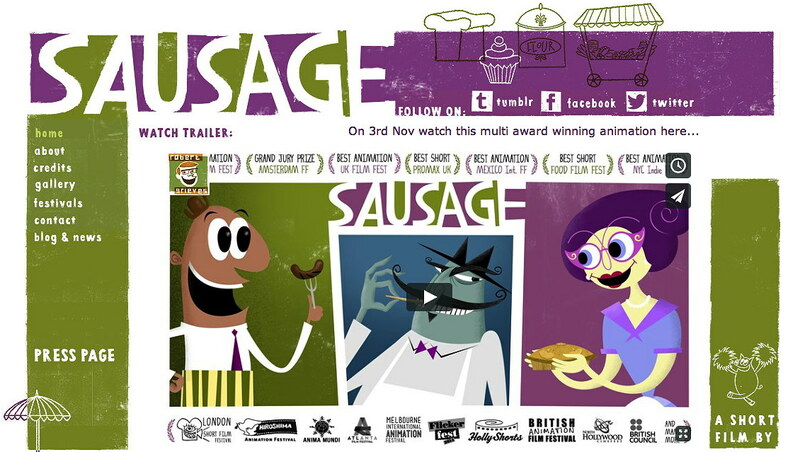 A pleasant surprise (and unfortunately not the norm) is the effort you put into the press campaign for Sausage’s online release – including some really cute Vine animations. How did you go about putting together such rich ‘one stop shop’ of information? Filmmakers often use up all their energy producing the film, then fail to let the world know it exists. I was not going to let that happen, so relentlessly sought advice and researched short film promotion, the best advice being to make a comprehensive ‘press page’. This makes it super easy for journalists and bloggers to access your materials, while also streamlining the process for you and your team. Once you set up a web page to collected all your press releases, film stills, crew bios, making-of assets, video interviews, etc. etc. etc., then you direct as many influential people to it as possible. I also emailed detailed questions to filmmakers who’ve promoted their films well, and even interviewed one of the best exponents Eoin Duffy for online magazine Skwigly. Given the film’s launch at the beginning of British Sausage Week I have to ask, what’s your favourite type of Sausage? The world has so many incredible torpedoes of meaty goodness (aka sausages). As patriotic and kinda boring as it sounds, my favourite is a classic English Pork (of the best quality of course). But feel free to offer me a Toulouse, Chorizo, Smoked Polish, Merguez and even Kanga Banga (yes, that’s a Kangaroo Sausage). 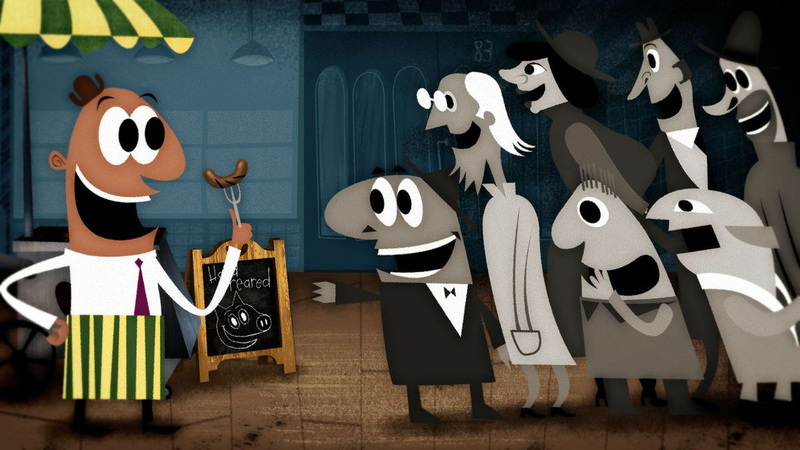 As a now multi-award winning and Oscar long listed animator will we be seeing a new short from you in the near future?